A few nights ago, I learned that after years of patiently growing my hair out, it is FINALLY long enough to construct Princess Leia style hair buns. Fascinating, I know. I'm sure I'm not the only girl with insomnia who often spends the painfully quiet and dead moments of the late night/early morning passing the time by distracting herself with ridiculous and stupid activities, once her ability to focus on important things has worn off despite her inability to sleep. 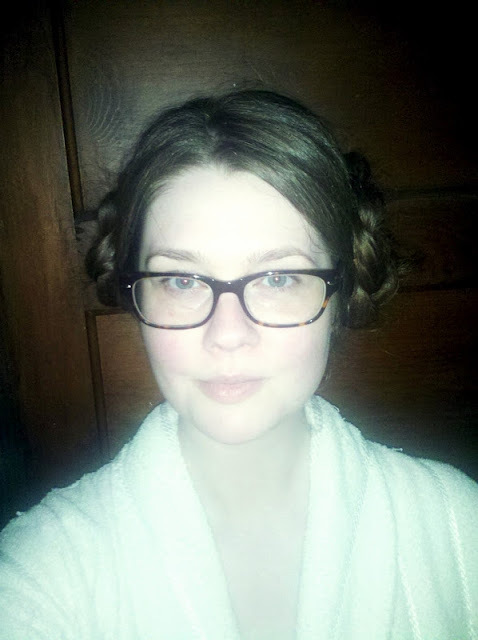 Because I am sure of this, I share my pursuits with you, so you can take comfort in knowing that you are not the only weirdo making princess Leia hair buns in your bathrobe at 4 o'clock in the morning. And just in case I AM the only weirdo who has done this, you should know that this experience inspired a weirdo drawing, so despite the stupidity, it actually proved to be a fruitful occasion. Well, it lead to one at any rate. And that's something. Something from nothing? I should probably stop speaking(er, typing) now.